SpaceX is targeting Jan. 7 for launch of its first Crew Dragon commercial ferry ship on an unpiloted test flight to the International Space Station, NASA announced Wednesday, a major milestone in the agency's drive to end its sole reliance on Russian Soyuz crew ships for carrying astronauts to orbit. If the shakedown flight goes smoothly — and if a NASA safety probe unveiled Tuesday doesn't turn up any show stoppers — SpaceX could be ready to launch the first piloted Crew Dragon atop a Falcon 9 rocket in the June timeframe, carrying veteran NASA astronauts Robert Behnken and Douglas Hurley to the space station. Boeing also is building a commercial crew spacecraft called the CST-100 Starliner. An unpiloted test flight currently is planned for March -- a specific date has not been announced -- followed by a piloted flight to the station in August. Boeing will use United Launch Alliance Atlas 5 rockets to boost Starliner spacecraft into orbit. Both companies still face a variety of technical hurdles, and the dates are tentative at best. Boeing has encountered propulsion problems in the Starliner's abort system and is behind schedule on key tests while SpaceX faces "serious difficulties," according to the NASA Aerospace Advisory Panel, including concerns about high-pressure helium tanks used in the Falcon 9 booster and parachute issues with the Crew Dragon. But SpaceX officials say the company is on track for launch in January and that hardware processing, crew training and ground support preparations are proceeding as planned. However it plays out, NASA managers are hopeful one or both companies will be certified to begin operational crew rotation flights sometime next year, ending the agency's reliance on Russian Soyuz spacecraft, the only available transportation for U.S., European, Canadian and Japanese astronauts since the retirement of the space shuttle in 2011. The unpiloted Crew Dragon flight coming up in January, known as Demo-1 on the SpaceX manifest, will launch from historic pad 39A at the Kennedy Space Center. Liftoff is expected around 11:57 p.m. EST (GMT-5) when Earth's rotation carries the pad into the plane of the station's orbit. Once released from the Falcon 9, the spacecraft is expected to carry out an autonomous rendezvous with the International Space Station, gliding in to a docking at the lab's recently modified forward port where shuttles once berthed. After a short stay, the capsule will undock and return to Earth with an ocean splashdown. On Tuesday, The Washington Post reported NASA is launching a major review of the safety "cultures" at both Boeing and SpaceX. In a statement, NASA said the review is intended "to ensure the companies are meeting NASA's requirements for workplace safety, including the adherence to a drug-free environment." "We fully expect our commercial partners to meet all workplace safety requirements in the execution of our missions and the services they provide the American people," the statement continued. "As always, NASA will ensure they do so." The Post, citing sources, reported the review was triggered in part by the recent behavior of SpaceX founder Elon Musk "after he took a hit of marijuana and sipped whisky on a podcast streamed on the internet." 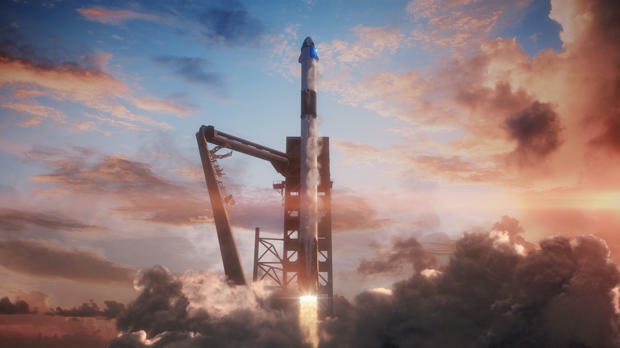 A SpaceX spokesman told CBS News human spaceflight "is the core mission of our company" and "there is nothing more important to SpaceX than this endeavor." "We take seriously the responsibility that NASA has entrusted in us to safely and reliably carry American astronauts to and from the International Space Station," he said. "For years, our engineers have worked side-by-side with NASA, creating a strong partnership and guiding the development of Crew Dragon, one of the safest, most-advanced human spaceflight systems ever built." He said the company actively promotes workplace safety and managers are confident "that our comprehensive drug-free workforce and workplace programs exceed all applicable contractual requirements." For its part, a Boeing spokesman said the company's culture "ensures the integrity, safety and quality of our products, our people and their work environment. As NASA's trusted partner since the beginning of human spaceflight, we share the same values and are committed to continuing our legacy of trust, openness and mission success." The commercial crew program grew out of a NASA-sponsored competition that began in 2011 and ended in September 2014 when the agency announced Boeing and SpaceX would share $6.8 billion to develop independent space taxis, the first new U.S. crewed spacecraft since the shuttle. SpaceX is building the Crew Dragon under a $2.6 billion contract. SpaceX also holds NASA contracts valued at more than $2 billion for 20 space station cargo missions using unpiloted Dragon capsules. A subsequent contract for an unspecified amount covers another six cargo flights. Boeing was awarded a $4.2 billion contract for CST-100 Starliner development. Unlike the Crew Dragon, the Starliner will use parachutes and airbags for ground landings in the western United States.